The booming electronics market is obviously great news for all those involved in the industry, but some drawbacks are beginning to take shape in the form of electronic component shortages worldwide. Electronic components are the atom of the electrical ecosystem. They’re found in everything -- from the smartphone in your pocket, to the wind turbines outside your window. With limited availability, it creates a bottleneck that will affect production in virtually every market. It’s important to know what’s causing the disruption in your market, the effects it will have, and what you can do to cope with it. What Caused Your Electronic Component Shortages? Booming technology advancement. Two of the hottest topics in the electronics industry in recent years has been the Microsoft ‘Internet of Things’ and its continued takeover of the marketplace, and the impending switch to 5G connectivity. Continued growth in key sectors (medical and automotive). This causes higher-than-anticipate demand for components. So, when will this end? The simple answer is: no one really knows! But due to the above factors, and the unlikelihood of them becoming irrelevant to the electronics industry, expect the shortage to last throughout 2018. Prepare yourself, as its likely to get worse before it gets better. All of this information can be a lot to take in at once, especially given the bleak outlook of the storm not slowing down anytime soon. One of the most prominent shortages revolves around multilayer ceramic capacitors (MLCCs). These are the most used capacitor in electronics, so it’s a big deal. Increased demand is the culprit. For example: Apple nearly doubled the number of MLCC’s used in the iPhone 6S for its most recent model, the iPhone X. Component manufacturers are now restricting the number of components a vendor can purchase. The limitations are based on the previous year’s orders. For example, if DigiKey purchased one million 0402 packages in 2017, they cannot exceed that number in 2018. The most prominent effect of the shortage is on lead times. 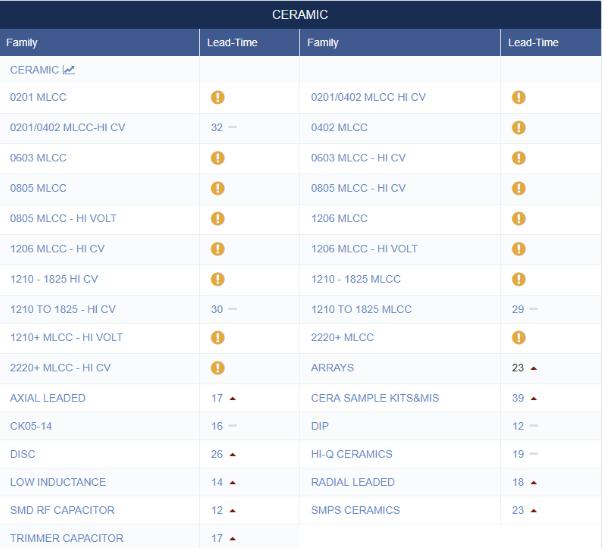 You’ve likely seen this first-hand by now, but component lead times have been steadily rising, if not skyrocketing in some cases. It is also a good idea to cast a wider net – broaden your use of vendors to increase your chances of securing parts that are hard to come by. In combination with adding these new vendors to your Approved Vendor List (AVL), you can also add additional part numbers. Oftentimes there are a multiple part numbers that will meet your needs, but only one is entered into the AVL. Make sure to enter each part number to maximize your chances of landing one that keeps your processes moving in the right direction. Be sure to include component replacement options in your bill of materials if your contract manufacturer is handling inventory. This will provide them with a backup option if a part does become unavailable.